Your family will think they have hit the jackpot when they see the reservations you made for Gold Coast Resort. This North Myrtle Beach resort has a stunning location. It is a North Myrtle Beach resort that is right between the beautiful Atlantic Ocean and the tranquil salt marsh inlet. Nestled in the Cherry Grove section of North Myrtle Beach, South Carolina, Gold Coast Resort is near a popular fishing pier, just minutes from live entertainment theatres and right around the corner from delicious seafood at all-you-can-eat seafood buffet restaurants. Gold Coast Resort is a quaint North Myrtle Beach resort with a long wooden sun deck that is equipped with tables and chairs and umbrellas. 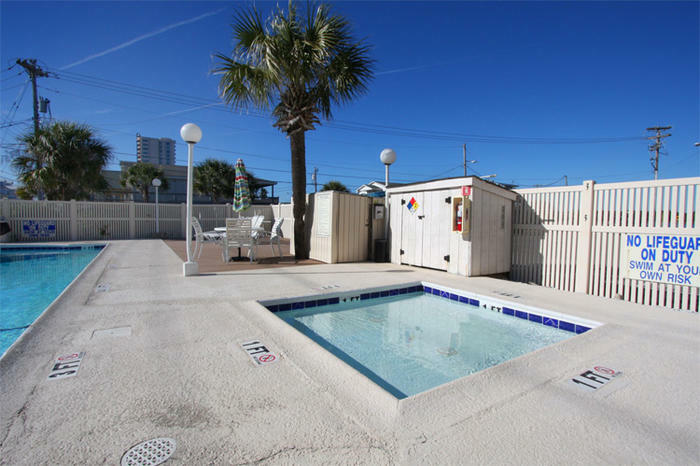 There is also a kiddie pool at this North Myrtle Beach resort so the little ones in your family can have a good time playing safely in their own swimming pool. There is even a wooden deck that offers amazing views of the salt marsh inlet. Have a picnic on this deck or just sit out there and watch the sunset over North Myrtle Beach, South Carolina. Bring your family to a private North Myrtle Beach vacation rental at Gold Coast Resort or make reservations for two and enjoy a romantic getaway at this North Myrtle Beach resort. A swimming pool sparkles in the sunlight and sea breezes blow in from the Atlantic Ocean. This North Myrtle Beach resort features one-bedroom, one-bath condo rentals that sleep from two to five people comfortably. A small kitchen in each of these condos in North Myrtle Beach, South Carolina comes complete with a refrigerator, microwave, stove and oven. Having these appliances at your fingertips during your North Myrtle Beach vacation is most convenient. Laundry facilities are on site at Gold Coast Resort. They are located on the first floor of this four-story North Myrtle Beach resort. You can put a load of laundry into the washing machine and then hit the swimming pool for a little while. Having laundry facilities on site is a convenience that active families treasure. From the private balcony of your North Myrtle Beach rental at Gold Coast Resort you can see the Atlantic Ocean. The white sandy beaches are so close to your North Myrtle Beach condominium that you can hear the waves as they crash ashore. Hanging out on the beachfront is a nice way to spend a North Myrtle Beach vacation day. Get up early and watch the sunrise over the Atlantic Ocean, a dazzling display that just might leave you breathless. Enjoy a long stroll down the shoreline and let the water rush over your bare feet. Build a sand castle, regardless of your age, and go for a swim and jump the waves. The beachfront is peaceful and it is adventurous. The beachfront in North Myrtle Beach, SC is all things to all people. Elliott Beach Rentals is not affiliated with onsite management or the HOA of Gold Coast Resort.